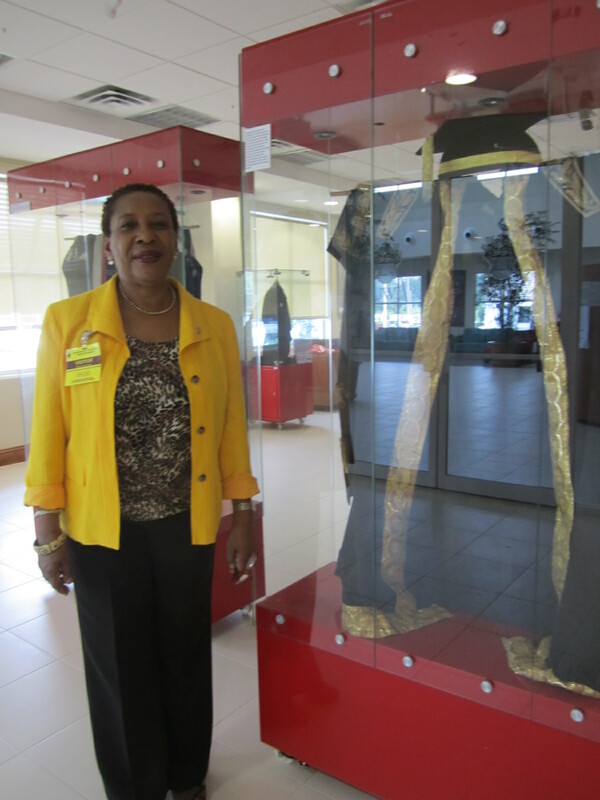 The Chancellor’s Gown – the original one, crafted for the installation of the U(C)WI’s first Chancellor in 1950 – is one of the more popular artifacts on display at the UWI Museum. So to answer some more of the questions we get, we’ve created a new folder of information and images, which is available to visitors right next to the gown. It explains when and why the gown was created. This task was entrusted to venerable British robemaker, Ede & Ravenscroft, which had been making rich robes for royalty as well as for university hierarchies, “for State, Church and Law” to quote a book on the firm, for hundreds of years. 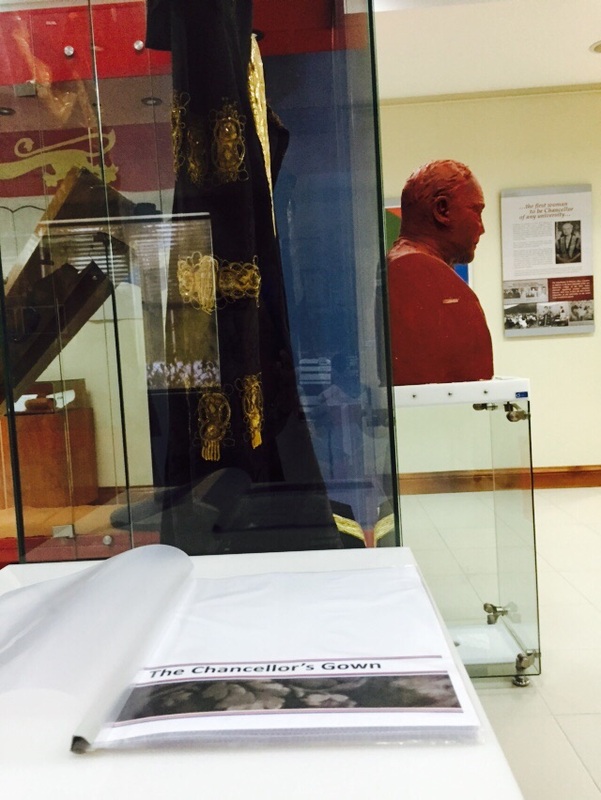 It also explains the provenance of this particular gown: how we can be sure that this is in fact the very one that Princess Alice wore to be installed as the then University College of the West Indies (UCWI)’s very first Chancellor on February 16, 1950. We have a little about the ornamentation on the grown, the acorns and oak leaves that are considered appropriate to academic institutions. And we list the Chancellors who have worn the gown over the decades. She was Chancellor through the life of the UCWI, and was reappointed as Chancellor of the independent University of the West Indies (UWI) in 1962, serving until her retirement in 1971. The university had by then decided, with utmost respect to the contribution of the first Chancellor, that her successors would represent the highest achievers from the West Indies. The removal of the train from the original Chancellor’s gown was doubtless both pragmatic and symbolic, as it passed to Trinidad & Tobago jurist Sir Hugh Wooding (1971-1974); St Lucia’s Sir Allen Lewis (1975-1989); Guyana’s Sir Shridath Ramphal (1989-2003) and Barbados’ Sir George Alleyne, a UCWI alumnus (2003 – present). No other women have yet taken up the Chancellor’s gown. Since 2006, Sir George has worn a replica of the original gown, and the original has been retired to the museum after more than a half-century in service.